Laboratories use high-performance liquid chromatography (HPLC) equipment across a spectrum of industries, including pharmaceutical, industrial, forensic and environmental applications. HPLC creates a mixture of a sample with a solvent to analyze the different components present. HPLC is a highly effective analytical technique, but how do laboratories manage the chemical waste generated? HPLC chemical waste is hazardous. The solvent used in the analysis is often flammable, creating a fire hazard. Additionally, samples injected for testing could pose health risks to laboratory personnel. Hazardous waste regulations require hazardous waste containers to be closed and sealed, except when adding or removing waste. But that’s not always the case. Some labs engage in dangerous waste collection practices, such as running waste lines into an open bucket, a glass carboy, or solvent containers, with sometimes nothing, or at most, aluminum foil or Parafilm stretched around the bottle’s neck opening to create a seal. Improper collection and management of hazardous waste pose risks to people and property. Laboratories need to adopt safe HPLC chemical waste disposal solutions to mitigate these safety concerns. 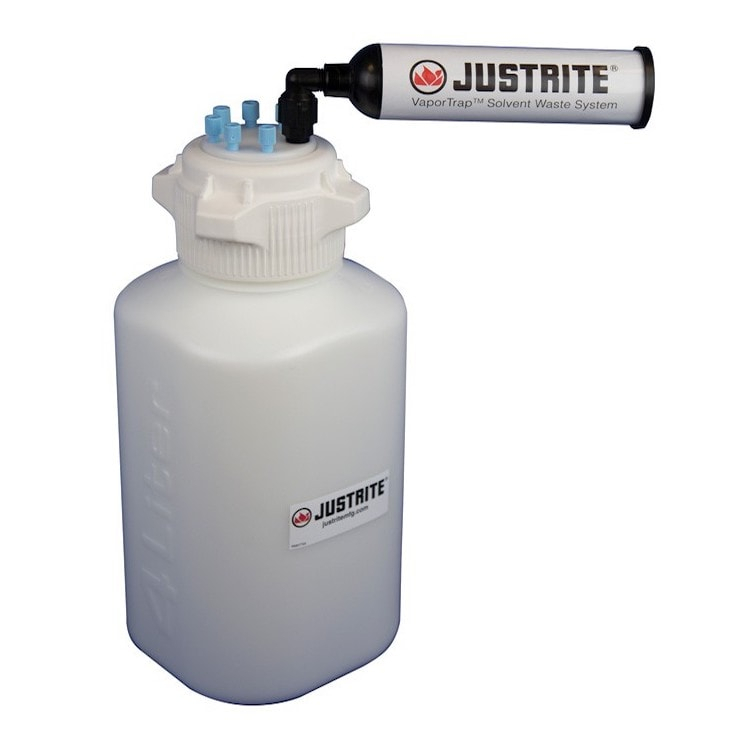 HPLC safety disposal cans from Justrite can receive waste from multiple HPLC machines. Each can has two quick-disconnect fittings - one intake and one vent. Valves automatically close when disconnected to prevent the release of vapors or liquids. A coalescing carbon filter attaches to the vent fitting and removes harmful gases, protecting lab personnel from adverse health effects. The filter is 99 percent effective in removing liquid particulates released as vapors. The carbon part of the filter changes color when spent. 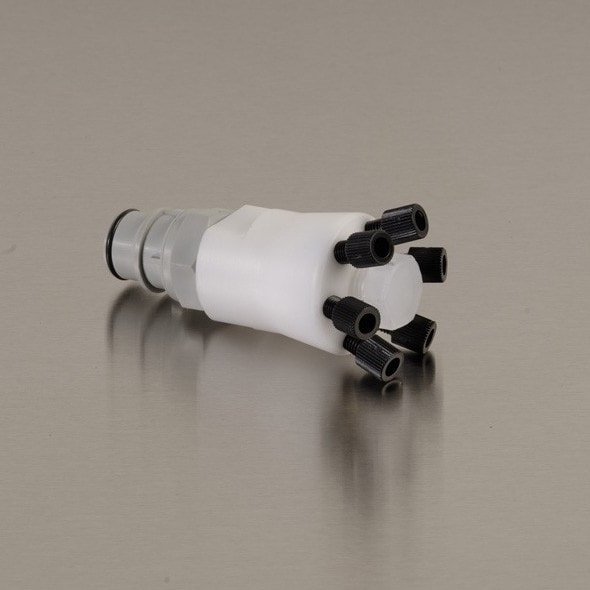 A PTFE manifold with compression fittings is available for the inlet connection. The manifold accepts up to six waste lines to discharge into the can. A second manifold connects to the first to enable a total of 12 HPLC machines to attach to a single safety disposal can. Cans with stainless steel fittings feature manifolds with up to four waste connections. 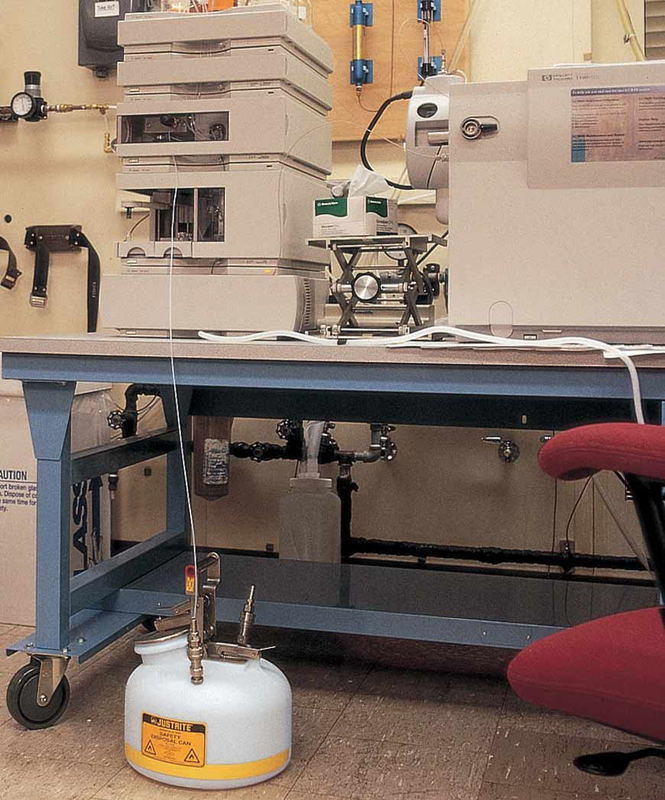 HPLC safety disposal cans have a large pouring spout with a stainless-steel flame arrestor. A spring-loaded lid provides pressure relief and prevents explosions. An easy-carrying handle with a fixed position latch keeps the lid open for easy and controlled pouring. Justrite’s HPLC hazardous waste containers are FM approved. As a third-party testing and certification agency, FM Approvals evaluates products to ensure they meet the highest standards for property loss prevention and safety. Justrite VaporTrap Solvent Waste Systems consist of a HDPE carboy and two 83-mm polypropylene caps (one with a ported adapter for waste collection and the other closed for safe transport). Various ports and fittings attach to the adapter for waste collection. Its carbon filter prevents volatile organic compounds vapors from releasing into the air. HPLC chemical waste lines connect directly to the cap adapter to channel the waste into the carboy. Once full, remove the adapter from the cap to maintain the leak-proof system. The carbon filter attaches to any of the standard ports on the adapter. It fits upright or at a 90-degree angle for space limitations. 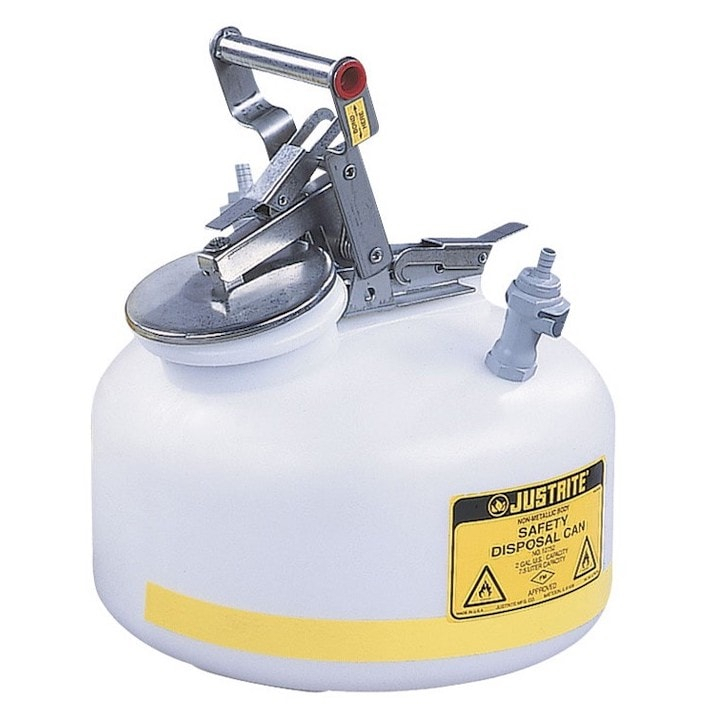 For safe transport of hazardous liquids, Justrite offers VaporTrap UN/DOT Solvent Waste Systems. The carboy is UN/DOT rated and the HDPE cap has a UN rating of 3H1/Y1.8/100. These systems are specifically designed for packaging group II and hazardous chemicals. HPLC machines add great value to laboratory work. Justrite HPLC chemical waste disposal solutions help labs take advantage of their benefits. They also contribute to a safer workplace. Sealed safety cans and carboys with leak-proof systems ensure HPLC waste stays where it belongs. Coalescing carbon filters even make sure the vapors pose no risk to laboratory workers. 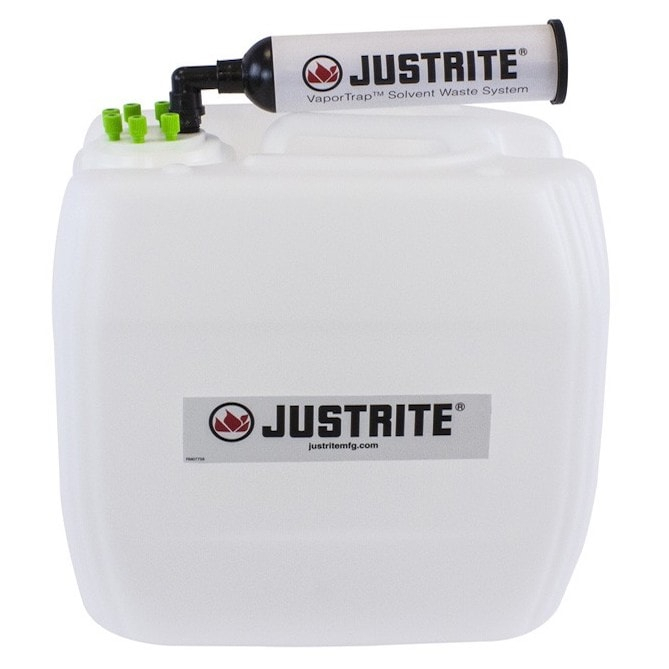 Justrite supplies a wide variety of HPLC chemical waste management equipment designed for the laboratory environment. Check out all our HPLC chromatography containers and solvent waste systems.